Unfortunately, sometimes those with work-inhibiting, long-term disabilities are denied the benefits they deserve. Insurance providers may use any excuse they can to avoid doling out coverage payments for such a long period of time. They may even deny a claim without providing any sort of solid justification for their actions. If you have been a victim of such unfair treatment, you deserve to take legal action against your insurance company. An Indiana long-term disability attorney from the Hankey Law Office can provide you with the competent representation you need. To learn more, call us today at (800) 520-3633. If your claim has been unreasonably denied by your insurance company, then you may have the right to take legal action and fight for the compensation that you deserve. The Indiana long-term disability lawyers of the Hankey Law Office can help you file a law suit against your insurance provider. Our attorneys work closely with each of our clients to see that they are comfortable with the litigation process and what it entails – the costs, risks, and benefits. It is important for you to receive experienced representation from an attorney who knows how to present a strong case. This way, you will be able to reach a resolution that will work best for you – whether it is a lump sum payment or being provided with the LTD benefits you deserve. Dealing with the hassles of the long-term disability litigation process can be extremely difficult and frustrating without the help of an experienced LTD attorney. 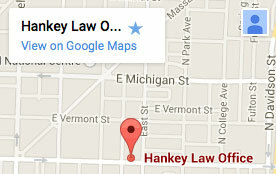 The Indiana long-term disability lawyers of the Hankey Law Office are ready to guide you through this difficult time. Contact us at (800) 520-3633 to get the legal support you need.